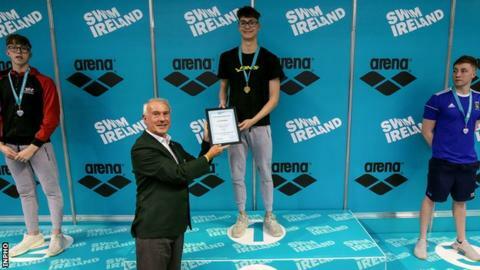 Jack McMillan set a new national record in winning the men's 400m freestyle title on the opening night of the Irish Open Swimming Championships in Dublin. Bangor swimmer McMillan finished in a time of 3:53.31 to better Andrew Meegan's 2013 mark by nearly a second. Lisburn's Daniel finished in second place behind McMillan with UCD swimmer Dean Power taking third place. McMillan's team-mate Rachel Bethel and Callum Bain of Cookstown were among the other gold medal winners. Bethel had over eight seconds to spare in the final of the women's 400m freestyle as she stormed to her fourth consecutive national title over the distance. Bain won the men's 50m butterfly in a close final as the University of Stirling student touched the wall in 24.28 seconds but just two-tenths of a second separated the three medallists with Brian O'Sullivan taking silver just ahead of Max McCusker. The race of the opening night was the men's 100m breaststroke final as Longford swimmer Darragh Greene qualified for the World Championships in July in a time of 59.98 - a new championship record - with Rio Olympian Nicolas Quinn finished second and 16-year-old Eoin Corby took third in a new Irish junior record that also secured his place at both the World and European Junior Championships this summer. Niamh Coyne, 17, was over two seconds quicker than her closest competitor in the women's 100m breaststroke final - taking gold in 1:07.94 - and Dubliner Ellen Walsh won the women's 50m butterfly ahead of Jena Macdougald, who set a new junior record in the heats, and Larne's Danielle Hill.